In May’s Putting Learners First webinar, VP of Product Marketing Todd Tauber, presented on the current issues with L&D approaches and how to make the shift to put learners first. In this final recap post we’ll explore reimagining L&D for learners. For the first two sections of this Webinar checkout Webinar Recap I: Why It’s Time to Rethink L&D Approaches, and Webinar Recap II: How To Make The Shift. The hard part is doing the work to actually reinvent workplace learning. Transforming how L&D works all at once can be a huge, complicated job. It often takes months or years, depending on how complicated the organization is. The key is not cost cutting and reorganizing, though. It’s investing time and money differently. L&D organizations only really invest in 3 things: people, content and tools. Companies who are making this shift are approaching their content and programs very differently. – They still do programs and classes and online courses, but they’re tilting the balance much more heavily toward experiential, social and on-demand learning experiences, with more modern formats like short videos, simulations and apps. These companies are able to do that in large part because they’re changing their people and processes. – Some are cleaning house and starting over, looking for new kinds of learning consultants and instructional designers who “get” the business and audiences better. – Others are evolving, re-training their existing staff, adding new kinds of people into the mix alongside their or even creating entirely new roles. – Several companies – for example Bank of America, EY, LinkedIn, Macy’s and Nike – now have product managers instead of (or in addition to) their LMS administrators. The problem with different people trying to do different things is that it’s creating some new problems, those problems demand new and different kinds of technology to work better. Very few authoring tools or LMSs, for example, make it easy to create, find, access or track informal learning content or social and on-the-job learning experiences. Most authoring tools and LMSs were designed and built for an era of one-to-many learning – the broadcast model. Now, people do a lot more than just consume; they’re also crowdsourcing and collaborating. Learning is no longer one-to-many, it’s many-to-many. A lot of learners (and L&D teams) now need better tools for creating, curating and sharing learning. – Almost 90% of workers say that sharing knowledge is an important or essential part of learning what they need for their jobs. -Only around ⅓ of employers have invested in dedicated social learning systems. Creating learning is only the first step, though. Learners also need better tools for finding the right things at the right time. We are all overwhelmed by information. We are also all impatient. Especially online- if we can’t find what we want – fast – we move on. Learning content is so easy to make, and so cheap to buy now that it’s become almost too available. Making sense of all the learning clutter out there is a growing problem. Finding the right content isn’t much use if people can’t access it. One word: Mobile. More than half of workers now say they would like to be able to access learning on mobile devices. They may not all need it to do their jobs, but they want it. Most companies are barely scratching the surface when it comes to mobile learning. Sure, it’s encouraging that more than 70% of organizations now say they’re doing something with mobile learning. However, only 12% of learning content is actually mobile-ready. Companies that do that are just trying to stuff the toothpaste back in the tube, though. It’s become clear that both L&D organizations and individual employees need better ways to track, measure and value all of their learning. Almost every CLO says they feel the need and urgency to demonstrate the value of their organization’s investment in L&D. In spite of that need and urgency, less than 30% of big companies capture much data on their informal learning activity. It’s hard to manage L&D when you can’t see the whole picture. It’s also hard for individuals to act on that data. Even if they did collect it, it’s rare for employers to provide workers with easy access to information about their development beyond basic LMS transcripts. 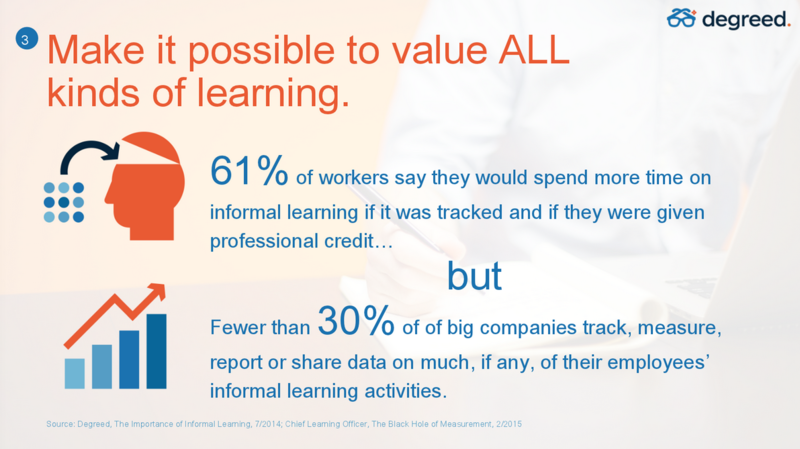 Almost ⅔ of working professionals that we’ve surveyed say they would spend more time on informal learning if it was tracked and given professional credit of some kind. – For creating and curating learning. – For discovering and finding learning. – And for valuing learning.